If I could afford it, the one Festool at the top of my list is the Domino joiner. 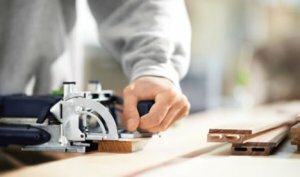 The Domino takes the idea of the biscuit joiner, but instead of using thin football-shaped pieces of wood, it uses small wooden tenons that fit into a Domino-cut matched mortise. Tenons have been used for thousands of years so we know they are strong, and the fact the the tenons run perpendicular to your wood rather then parallel to it like biscuits, is sure to make a difference.